Michele Gilman is member of the Committee on Litigation and Legal Priorities of the ACLU of Maryland and the Judicial Selection Committee of the Women's Law Center of Maryland. At the Supreme Court on Tuesday, the eight remaining justices deadlocked 4-4 over whether public employee unions could require nonmembers to pay dues for the work they do negotiating on their behalf. A tie means the last lower court ruling stands, and unions – which have helped reduce inequality – can breath a sigh of relief, for now. And the Roberts Court – named after Chief Justice John Roberts, who took the helm in 2005 – deserves at least some of the blame. If the fortunes of workers and consumers rose with that of business, this bias might not matter. But that is not the case. Another is in Harris v. Quinn, in which the court ruled that home health care workers did not have to pay dues to unions for representation in collective bargaining. By reducing their resources, the court limited the ability of unions to improve working conditions for these low-wage workers. As Justice Elena Kagan stated in dissent, collective bargaining had helped Illinois’ home health care workers double their wages, achieve safer workplaces and obtain health insurance. Scalia’s absence changed the outcome significantly (though 4-4 rulings can’t set precedents like majority ones). Given the current fissures in the court’s makeup, the next justice may well have the power to shape key features of our economy and its workers’ lives in the future. This wasn’t always the case. During the postwar era to the late 1970s, America had shared prosperity, largely as a result of government policies such as the GI bill (which sent vets to college), a progressive tax system and a strong labor movement. 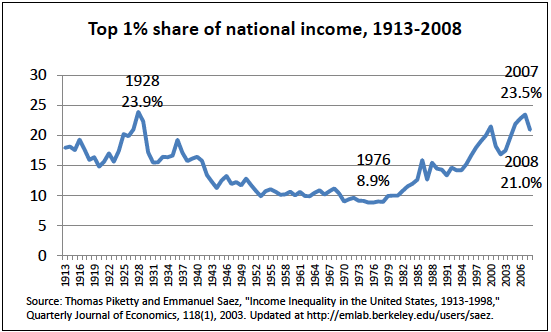 Thirty years ago, the top one percent earned 12 percent of the nation’s income. Today, that number is about 21 percent.